Coincidences and luck are challenging elements for many writers. Read K.M. Weiland's take on coincidences in fiction. Let me know if you think she's spot on or not. Coincidences are awesome. In real life. But coincidences in fiction? Unfortunately, the same rules don’t apply. In fact, a poor use of coincidences in your story can make or break your readers’ ability to suspend their disbelief and enjoy your plot. In real life, coincidences are (usually) cool. They’re inexplicable, seeming freaks of destiny that tickle our brains with their mystery. When the teller at the bank turns out to be the little neighbor girl you played with as a kid or when you find the perfect outfit at a garage sale or when a flat tire delays you enough to keep you out of a seven-car pileup on the Interstate–those are all awesomesauce. Our brains delight in the impossible happenstance of it all. It’s like a fairy gift: all the niftier because it’s unexpected and unexplained. But here’s the thing about coincidences in fiction: readers are expecting a gift and they want it to be explained. We believe in the crazy things that happen in real life, simply because we have no choice: there’s the proof right there in front of us. We have to believe it. It happened! It’s real! Fiction, however, ain’t real, and we all know it. When the author lets fall a coincidence right out of the sky, readers instinctively reject it. They know this isn’t a true coincidence. In fact, it’s totally explicable: the author caused it to happen because he was too lazy to think of anything better. Not quite the reaction you’re going for your in the fiction? Me either. Today let’s tackle the causes and remedies for coincidences. 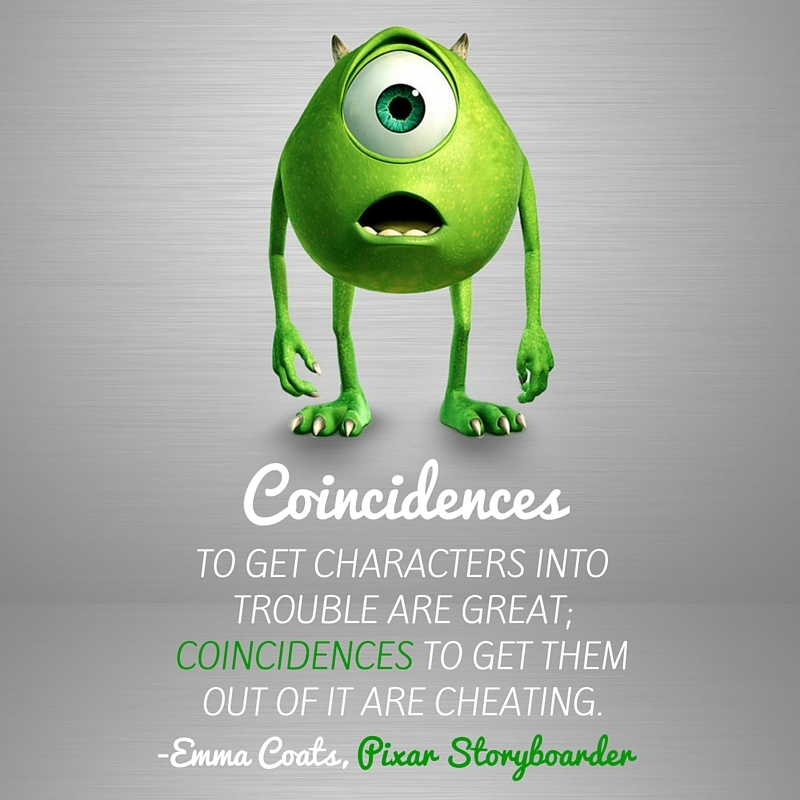 Are Bad Coincidences Killing Your Story’s Cause and Effect? Coincidences in fiction make readers mad. Got it. But why do they make readers mad? Why don’t readers believe in them? Simply because coincidences are, by their very nature, a violation of cause and effect. A coincidence is something that happens for no obvious reason. No reason means no cause. Basically, we’re getting an effect out of the blue. Usually, this effect is something positive for the character and, as a result, something neither the character nor the author has earned. Here’s where plotting often breaks down in bad scripts–after the initial “serve” the protagonist or antagonist quit playing for a while, and the ball bounces back and forth on its own. That’s impossible, and we know it. Or, the ball is hit to some other player on some other court; and even if the ball is hit back to our court and our protagonist, it isn’t really part of the game, is it? When something (good or bad) happens without reason, it seems impossible. It’s that ball bouncing back on its own. Or, the protagonist swings his racquet and misses, but the ball hits a bird flying over the court and goes back to the antagonist’s side of the net. That just doesn’t seem within the rules! We want the ball to bounce back and forth between the antagonist and protagonist–the Hero and Villain–each reacting to what the other has done. This kind of intricate cause and effect should be true on every level of your story, but nowhere more so than in the major revelations and plot turns. Consider yours carefully. What is causing these moments to happen? 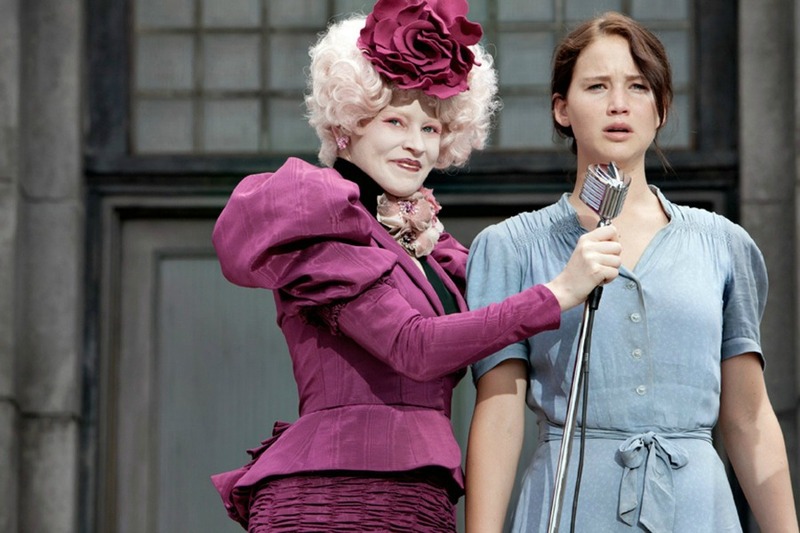 Is it the protagonist who is causing the antagonist to move–and vice versa? Or are side events wiggling in to push the story forward? 1. You’re not taking advantage of the existing back-and-forth conflict between protagonist and antagonist. 2. The conflict between the protagonist and antagonist wasn’t strong enough to begin with, so you’ve tried to substitute with a side conflict. Neither will put you on the path to a seamless plot. Is There Ever Such a Thing as Good Coincidences in Fiction? Before we get too carried away with our coincidence bashing, let’s take a second to consider whether it’s true all coincidences are bad. Roger Thornhill accidentally hailing the page boy who is looking for a government agent in Alfred Hitchcock’s North by Northwest. Harvey Cheyne falling into the ocean and being rescued by fisherman Manuel who just happened to be there in Rudyard Kipling’s Captains Courageous. Katniss’s sister Prim just happening to be drawn as a tribute in her first eligible year in Suzanne Collins’s Hunger Games. D’Artagnan just happening to insult Athos, Porthos, and Aramis on his first day in town in Alexandre Dumas’s The Three Musketeers. Flik (speaking of Pixar) catching just the end of the circus bugs’ Robin Hood act and believing they’re really warriors in A Bug’s Life. All of these things just happen. Although there’s some causal dominoes leading the protagonists up to a few of these examples, there’s not enough cause in play here to let any of these moments avoid being coincidences. Only one major coincidence per story: early in the story. Now that we know coincidences in fiction are baaaaad news, how do we stomp them when we see them coming? Here are four ways. As you’ve already figured out, this is the big gun in your war on coincidences. A story that is set up with proper cause and effect is a story that doesn’t need coincidences. What does cause and effect look like? First, Darth Vader invades Princess Leia’s ship in search of the Death Star plans. Then the droids crashland on Tatooine to escape him–which, coincidentally, turns out to be the home of Vader’s unwitting son (except–aha!–it’s not actually a coincidence, since Leia was above Tatooine on purpose, looking for Obi-Wan, who is also on Tatooine on purpose to watch over Luke. The only real coincidence at play here is Luke’s uncle just happening to buy the droids). Then the stormtroopers come looking for the droids and torch Luke’s aunt and uncle. Then Luke goes with Obi-Wan to find Leia. Then the Death Star captures them. It’s a dance–a tennis match–back and forth. The Empire makes a move, which provokes Luke into making a move, which causes the Empire to make a counter-move. No coincidences necessary. Your character causes something to happen because he’s in pursuit of a goal. He’s in pursuit of that goal in the first place because something is motivating him. In short, the character’s motivation is the reason for the effect. If readers understand what your character wants and why, they will be more likely to forgive what might otherwise seem coincidental behavior. Darth Vader suddenly going rogue and pitching the Emperor into the heart of the Death Star, in order to save a dying Luke, might seem a little coincidental on its surface. It might even seem like that most egregious coincidence of all: deus ex machina. But it’s not, because it is, in fact, an evolution of Vader’s personal development and motivation over the course of the trilogy. When he chooses Luke over Palpatine in the end, it makes sense. If it makes sense, it’s not a coincidence. Now, it’s time for a caveat and an admission: as much as you want to avoid coincidences in your story, you probably won’t be able to cut out 100% of them. Stories–especially novel-length ones–are unwieldy beasts at the best of times. Even the most skilled authors rarely get all the loose threads perfectly tied away (just ask Charles Dickens, who was a master of the coincidence). Sometimes, you’re just plain going to need to sneak in a little coincidence, in order to get the story to work. When that happens, you need to do your best to make the pill an easy one (yea, preferably an unnoticeable one) for readers to swallow. One way to do that is by foreshadowing the coincidental element earlier in the story. Even if the plot development doesn’t properly result from natural cause and effect, at least it won’t catch readers completely off guard. You can also do a little mopping up after the fact. After the necessary coincidence has taken place, don’t just ignore it. Sometimes having your characters acknowledge the coincidence in passing–or offer their explanation for what just happened, as we often do in real life in the wake of a coincidence–can help scratch the little niggle of doubt in your readers’ brains. Being upfront with readers keeps you from looking like idiot (Wow, did she really not even realize she wrote that coincidence? ), and with a little luck and a lot of skill, you might even be able to explain away half the problem by the time you’re done. Once you understand why coincidences in fiction happen–and when it’s okay and when it’s not–you can use your awareness to protect readers from ever tripping into gaping plot holes or suspense-of-disbelief pitfalls.